These shortcut Chocolate Chip Praline Bars start with a Martha White Muffin Mix and topped with a caramel sauce, toasted pecans and butterscotch chips. 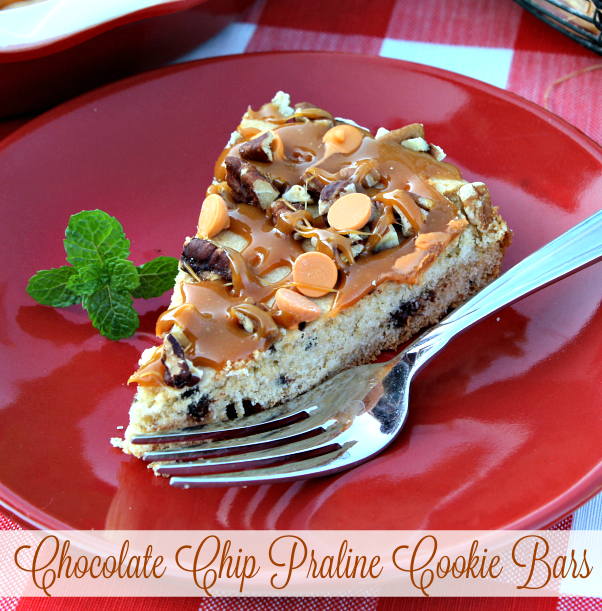 Today I have a deliciously easy treat to share with you, Chocolate Chip Praline Cookie Bars. These easy cookie bars start with a Martha White Chocolate Chip Muffin Mix and topped with a ooey-gooey praline sauce, toasted pecans and butterscotch chips. This recipe and many more are included in a new e-cookbook Easy Favorites from Martha White & Friends. This free e-cookbook is filled with recipes that start with a Martha White baking mix (sweet and savory) along with a few pantry staples that you probably have on hand. Here's a list of the amazing recipes that are included in this purdy e-cookbook. I also have another treat to share with you....... Do you like country music and the CMA Festival? 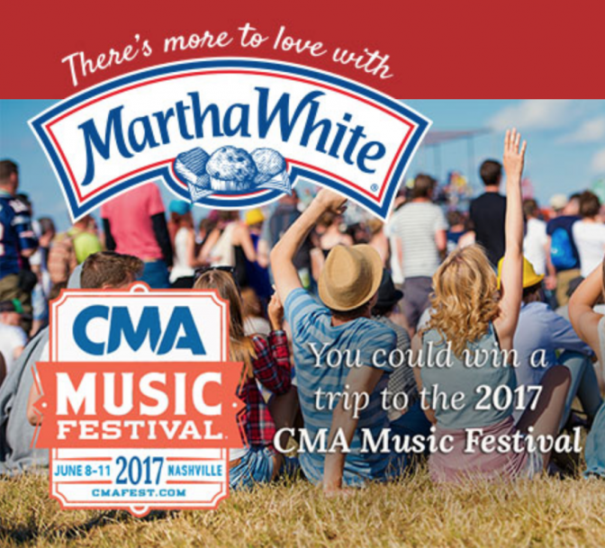 If so today is your lucky day because the nice folks at Martha White are giving away 4 chances to win a trip for 2 to attend the CMA Festival in Nashville, TN. The prize package includes airfare, hotel, transportation, etc. (see official rules for complete details). 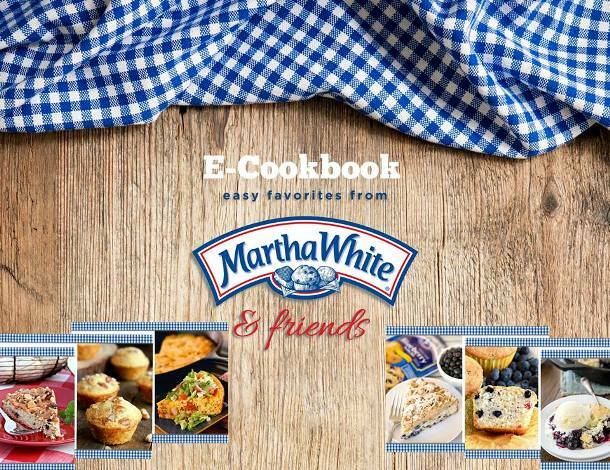 Click here to enter the Martha White Sweepstakes! "You can submit one entry per day during the promotional period"
I hope you enjoy this recipe and all the others in the new Martha White e-cookbook. Preheat oven to 350 degrees. Spray a 9 inch pie plate with non stick baking spray. Using a stand or hand mixer, combine, muffin mix, eggs, melted butter and vanilla extract. Cookie dough will be thick. Spread the cookie dough evenly into pie plate. Place pan in pre-heated 350 degree oven and bake for 20-25 minutes or until cooked through and the edges are lightly brown. Remove from oven and set aside to cook on a baking rack. In a small pot over medium-low heat, add the caramel bits and heavy cream. Cook until the caramels are melted (about 5-7) minutes. Cool caramel sauce slightly and drizzle over cookie bars. 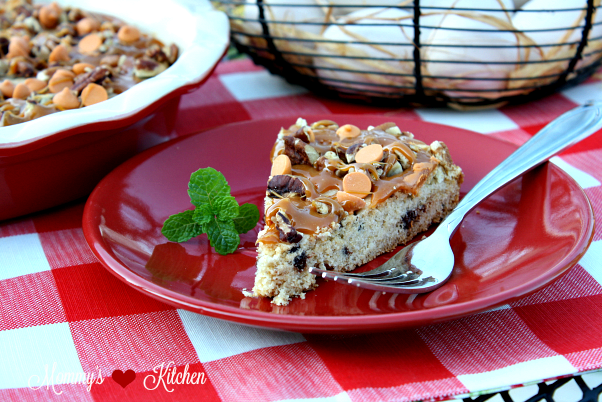 Sprinkle butterscotch chips and toasted pecans evenly over the top. Cut into wedges and serve. Cook's Note: For a chewier cookie bar add one 3 oz package of vanilla cook and serve pudding mix (dry) to the batter and increase the butter amount to 1/2 cup. Your cookie bars look delicious. To register for giveaway; A person is out of luck if the year they where born ends in a 9 cause there are no years that end with a 9. I was born in 1949 and only goes to 1948. Heading to check out the Martha White E-Cookbook. Hmm let me head over to their page and take a look at the form. I went and looked at the form and you're right Colleen! Hmmm that is so strange, but I have sent Martha White an email letting them know. Check back to enter because I'm sure they will have it corrected pretty quickly.